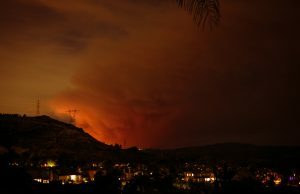 In early October 2017 more than a dozen wildfires broke out in the state of California. Burning simultaneously in eight different northern California counties, the event was called the Northern California Firestorm and burned 245,000 acres and forced 90,000 people from their homes. It also destroyed an estimated 8,900 structures including Santa Rosa Community Health Center’s largest site. The fire not only impacted the health center’s facilities, staff members were also affected, including two executives who had to be out for two weeks. As with MedCentro, many Santa Rosa staff were also displaced. About 20 staff members either lost their homes or had a family member lose their home. Some staff were unable to show up for work. The Santa Rosa site lost to the wildfires affected 180 employees who had to be redeployed to other sites. The health center provided helpful resources for employees and kept them aware of approaching deadlines for getting paperwork in. They also set up a special benefit for anyone who lost a home or had been evacuated so they could get cash immediately to help with replacing the essentials. “Even if they didn’t lose their home, they often evacuated with very little,” added Fuchs. The broader Santa Rosa community also stepped in to offer emotional and physical support. They brought massage therapists on site, discussed supporting each other through everything, and the health center provided breakfast and lunch for staff for two weeks. The destructive, and deadly, fires have some staff examining priorities. Fuchs says all displaced staff have found temporary housing or rentals at this point but many are still in flux, deciding if they want to rebuild or move. The health center recently lost a top manager because she had previously been worried about affording a home in Sonoma County and, after the fires, thought she would never be able to own a home in the area. As the health center continues to recover, leadership is providing staff with an outlet for discussing how they are being impacted and offering support through “listening tours.” This is especially effective after the adrenaline from the initial response wears off.